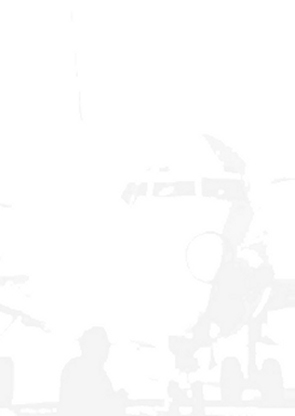 Click in the book cover to view a full size image. All of these texts are available in Pilot shops across Australia. Click here for a list. This product contains 3 typical ATPL Air Law practice exams to focus you on the type/depth/style of question you can expect in the real exam. There is also a bonus series of exam quiz modules focussing on the CAO's specifically. CAO questions typically form a large portion of the CASA ATPL Law exam. Multiple attempts at each exam/module. Suitable also for those converting from overseas ATPL. Book of 4 x "BAK PRACTICE EXAMS"
Realistic questions (over 165 in total) represent BAK exam requirements very well. Multiple attempts per exam/5 month access period. Written in conjuction with Aviation Theory Centre (ATC) manuals. Automatic online marking through Avfacts "Exams-Online" system. Automatic critique showing weak areas. A step by step worked answer file for questions requiring calculation is displayed. Your own personal access code supplied. Study at home at your own speed. Excellent final check of your knowledge pre-BAK and PPL exams. Written to cover the CASA BAK syllabus. References to VFR (day) work booklet as in real BAK exam. The types of question you can expect in the real exam. Internet access required for marking to occur. Rob Avery is the largest producer of pilot training products in Australia. Over 600 multiple-choice practice questions. Check your knowledge retention in graduated steps. Multiple attempts per quiz/longaccess period. Automatic online marking and KDR through Avfacts "Exams-Online" system. A step by step worked answer file forquestions requiring calculation is displayed. Your own personal access password supplied to you via email when you register the book online. The very best preparation prior to the BAK exam. Prepares you well for later licence upgrade to PPL or CPL studies/exams. References to VFR (day) work booklet(to be supplied by purchaser). The style of question you can expect in the real exams. Note: Internet access is required for online marking to operate. 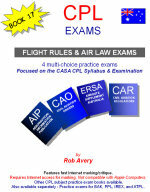 BOOK OF 4 CPL "FLIGHT RULES AND AIR LAW EXAMS"
Written by Australian pilot's, for Australian Exams. The 4 exams (total of 160 questions) that closely represent CASA CPL Law exam. Correct and in-correct responses displayed. Up to 4 attempts at each exam/6 months access whichever occurs first. Internet access required for exam marking to occur. Written by Australian pilot's, for Australian pilots. 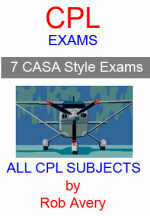 The 4 exams (total of 160 questions) closely represent CASA CPL AGK exam. Perfectly complimenting your study notes. Questions drawn from Aviation Theory Centre (ATC) manuals. Multiple attempts per exam/6 month access period. References to VFR (day) work booklet as in CASA exam. 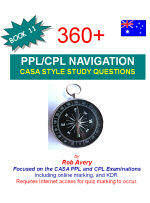 The 4 exams (total of 160 questions) are highly representative of CASA CPL AGK exam. Questions drawn from ATC manuals. 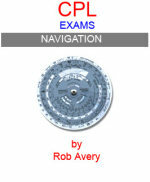 BOOK OF 4 x "CPL NAVIGATION EXAMS"
Step by step worked answer file for questions requiring calculation made available. Your own unique access code supplied for access. Questions (over 160 in total) drawn from ATC manuals. Exactly what you need to check your knowledge pre-CASA exam. Australian made for Australian Exams. 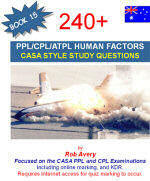 BOOK OF 4 x "CPL HUMAN FACTORS EXAMS"
Written by very experienced theory instructor. Questions (120 in total) drawn from ATC manuals. Perfect preparation tool for CASA exam. Austrailan made for Australian Exams. Austrailan made, targeting Australian Exams. Unique exam structure makes learning much easier. Your own personal access code supplied to you. Exactly what you need to check your knowledge before the CASA exam. Questions (160 in total) drawn from ATC manuals. Right on target for CASA exam depth. Only product of it's kind in Australia. Exactly what you need to check your knowledge before CASA exam. Written by Australia's most prolific aviation course/exam writer. 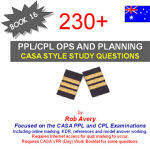 Book of 4 "CPL OP's, PLANNING, AND PERFORMANCE EXAMS"
Realistic questions (over 110 in total) represent CASA exam requirements very well. Step by step worked answer file for questions requiring calculation is displayed to you. Excellent final check of your knowledge pre-CASA exam. Written to cover entire CASA subject syllabus. Check out the huge range of Rob Avery Pilot training Products. 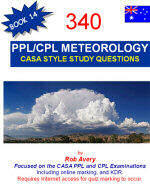 Book of 4 x "CPL METEOROLOGY EXAMS"
Realistic questions (over 150 in total) represent CASA exam requirements very well. Written to cover entire CASA Meteorology syllabus. Check out the huge range of pilot training products by Rob Avery. Realistic questions (over 235 in total) represent CASA exam requirements very well. The very best preparation prior to CASA exam. Written to CASA CPL syllabus. Four exams featuring CASA style questions. Multiple attempts per exam. Automatic marking/KDR/ answer working. Long access period. Exactly what you need to test your understanding before a CASA PPL Exam. Rec Retail Price AUD $35.00 inc GST per subject. Check out your knowledge progressively as you go through a syllabus subject. Suitable for PPL and CPL. Valid for PPL or CPL studies under Australian CASA syllabus. Choose from a range of 6 subjects. One book available for each subject. (eg: "Aerodynamics"). 100's of multi-choice quiz questions neatly aligned with chapters in Aviation Theory Centre (ATC) PPL/CPL training manuals. Questions check your knowledge at every step. Represent CASA exam requirements very well. Multiple attempts per quiz/long access period. References to VFR (day) work booklet as in CASA exam (to be supplied by purchaser). Rec Retail Price AUD $52.00 inc GST per subject. Set of 5 ATPL Navigation practice exams in one book. Online marking through access password supplied to you. Multiple attempts at each exam allowed. Superb focus on CASA ATPL Navigation exam type questions. Worked answer file (KDR) can be downloaded to assist you finding any thinking/calculation errors. Inexpensive way to check your knowledge. Best used in association with these Rob Avery products Av2 (ATPL Nav part 1), and Av9 (ATPL Nav part 2). 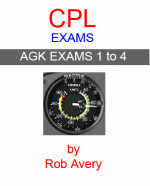 Best used in after reading these Rob Avery products Av1 ("Flying Glass" ATPL AASA part 1), Av4 (ATPL AASA part 2 - "Basic Gas Turbines"), and Av13 (ATPL AASA part 3). Book of 4 ATPL Performance and Loading practice exams. Superb focus from Rob of knowledge requirements by CASA for this subject. Multiple attempts per exam allowed. Downloadable KDR/worked answer file highlights calculation/understanding errors. Best used when read in association with Rob Avery ATPL book product Av15 Typical marks shown for each question. 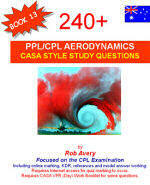 These reference texts address the ATPL syllabus, and are focussed on the CASA examination. There are over 180 pages that detail the types of questions you may encounter, and provide the simple methodology to solve them. Examples are given in each of the many topic areas, so that you can become accustomed to the CASA requirement of you , and the question style and depth. No stone is left unturned to ensure you have the maximum chance of passing on first exam sitting. Rob's students enjoy a near perfect first sit pass rate in this subject area. Like all of Rob Avery's reference texts, this book is spiral bound, so it can be laid flat for convenience. To review your knowledge, and set of 3 practice Performance and Loading cyba-exams are available separately via a CD ROM disk. 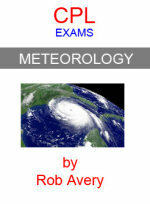 As a bonus, two practice meteorology cyba-exams are included. Access to the Internet is required for Cyba-exam operation. Access is provided for 6 attempts at each of the examinations on the purchased disc, or 4 months whichever occurs first, at which time access automatically expires. 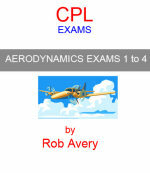 This is a complete course from Rob Avery, the leading exponent of ATPL studies in Australia. It leaves no stone un-turned to assure you are trained correctly and have the maximum chance of passing the CASA examination. Patented Plane Logic text flow assures ease of understanding. Easy step by step worked examples building to big picture knowledge. Plenty of review questions/worked answers in ATPL exam type format. Shows the easy way to get marks on the board with least effort and time. As used in Australias leading ATPL training course. Significantly less expensive than other competing courses. These limited edition texts are designed for those pilots finding difficulty understanding Flight Planning, or having difficulty passing the CASA examination. They cover all types of operation, both normal and abnormal. Over 60 worked CASA style questions, and featuring handy tips to save time in the exam. 111 pages. For best results, read in association with B727 Flight Planning Practice Examination" booklet (Ref Av3). This will suit those pilots seeking easy reading but concise texts which is specifically written to address the understanding required by pilots, NOT engineers. It is also vital reading for ATPL candidates studying for the Australian ATPL "Aerodynamics and Aircraft Systems" examination. Together with Aerodynamics and Systems Part 1 (Flying Glass), and Aerodynamics and Systems Part 2 (Basic Gas Turbine Engines), this book covers the entire CASA ATPL Aerodynamics and Systems syllabus, and great time and effort has been expended to make sure it imparts the knowledge required in a simple and easy to understand fashion. The previous lack of suitable study texts in this subject has long been identified by students around the globe as frustrating their efforts to pass the relevant examination. These three inexpensive books address that shortcoming, and at the same time provide focus as to the depth of knowledge required in the CASA ATPL examination. Part 3 features over 230 pages, plus numerous diagrams, and a quick reference index to save search time. As with other study books produced by Rob Avery, it is spiral bound so that when laid flat it does not close on you. Aerodynamics and Aircraft Systems - Part 3, covers the following syllabus topic areas in detail. Aerodynamics and Systems books 1, 2, and 3 are the ideal references for either ATPL students, or those studying toward university or TAFE examinations, and those preparing for airline technical interviews. Primarily of interest to those pilot's seeking easy reading, concise texts, specifically written to impart the knowledge required to pass the Australian ATPL Navigation Exam. Lot's of worked examples and diagrams to aid understanding and retention. Features review questions with model answers. As used in Australia's leading ATPL course. A must for anyone focussing on the CASA ATPL Navigation examination, or those pilots wishing to upgrade their knowledge for airline interviews. Lot's of diagrams, and every topic explained simply, in a way that Rob Avery is renowned for. If you are not using this book, you are working way too hard, and paying too much. A must for anyone sitting this difficult and time limited exam. There are 5 fully worked exams, each with 50 marks as in the CASA exam. Marks allocated are indicative of those in CASA exam. Quite simply, if you do NOT have this booklet, you are risking precious marks. At last a booklet of practice ATPL examinations with multi-choice questions and suggested answers. 4 x Aircraft Systems and Aerodynamics exams. 3 x Human Factors exams. 1 x Performance and Loading exam. This is an additional exam book to compliment the long standing "General ATPL Exam Book". 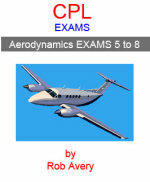 This is an additional exam book to compliment the long standing "General ATPL Exam Book", product code Av5. The eight practice examinations are completely different from those in code Av5, and the Cyba-exams via CD-ROM. There is no duplication. The ATPL exam subjects covered in this new exam book are Navigation, Flight Planning, Performance and Loading, and Aerodynamics and Systems. These four are generally regarded as the most challenging of the ATPL examinations, and so this book is a must for those about to sit the CASA exams in these subjects. Purchasers use the paper exams to find/record their answers, then go online using your unique access codes to get your examination paper marked automatically by the Avfacts cyba-exam system. Percentage marks will be displayed quickly, along with the correct answer, and incorrect responses. Internet access is required for marking to occur. You are then given an option of down-loading to a computer screen, the working for any calculation style questions. This file is in Acrobat PDF format. Purchasers simply fill in an online registration form accessible from the book. Registered purchasers will automatically be sent a new access ID and a password by return email, to use from then on, to enter the online marking for each examination. Each book can only be registered once, and to one owner. Purchasers receive 3 marking credits for each examination. Access to the online marking facility lasts for up to 12 months from the day the book is registered, not the day it was purchased it. Just sign on when you are ready to go. Access is provided for the initial purchaser only, and one computer IP code only is allowed by the cyba-exam security system. Note: Instructor help is NOT provided. 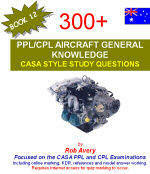 This book can be bought at most pilot supply shops around Australia, or through the Aviationshop online shop. Recommended retail price for the book is $62.70 including GST, plus postage. Book order code is Av18. Set of 4 x 30 multi-choice question IREX practice exams with suggested answers, and references. 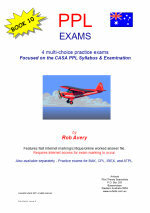 A must before sitting the difficult CASA IREX examination, this booklet is extremely popular. Free IFR internet tutorials available to registered book purchasers.